We are making the little red vest out of this pattern. Nut we're doing it in brown leather (steampunk western style). We are doing the pink dress in the middle with the ruffles for the dress. We found this vintage doll sewing pattern for life size dolls on ebay. Haven't seen them anywhere else. 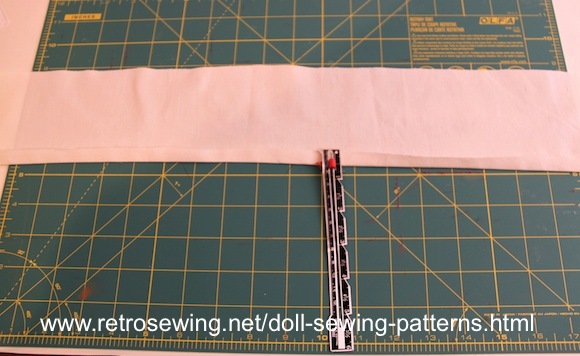 Life size doll patterns are not as easy to find as the more common doll sizes. Be sure to check the size doll it's made for before purchasing. 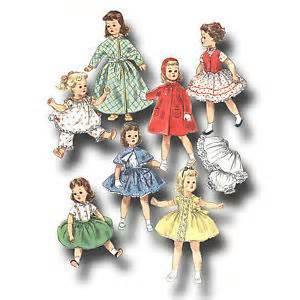 I'm so excited about my new retro clothes made from the vintage doll clothes patterns above Then, I'm getting permanent hair and a full makeover with a spray tan, makeup, some cool accessories, and who knows what else. YeeHaw! I can't wait. I feel like a star already. I'll be wearing a western "Steam-Punk" styled dress. 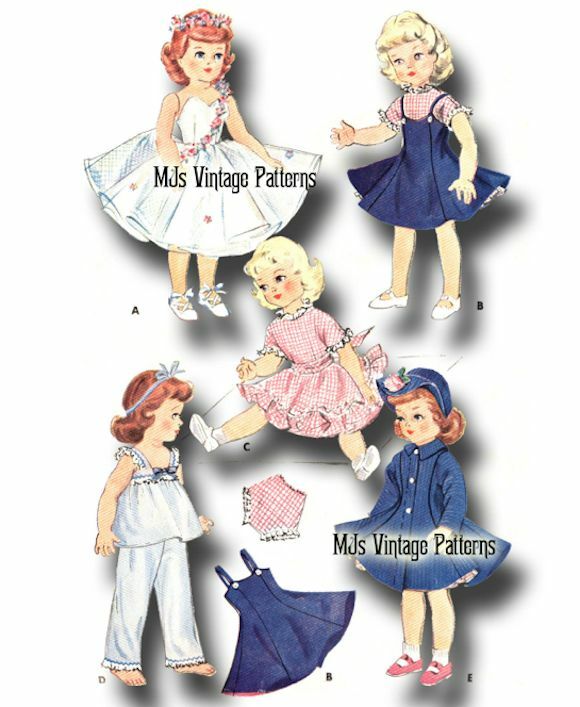 I like the dress pattern in the middle (above), and the red vest pattern from the pattern at the top of this page. The vest will be made of leather scraps from a previous project. Also a lace blouse, and boots too. If you'd like to be notified when my makeover video is ready for viewing, please Subscribe with only your email. I'm almost ready for my closeup. 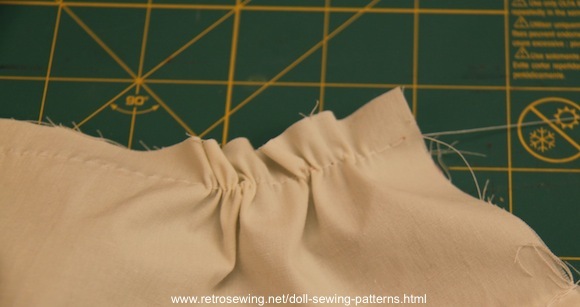 Sew across the top of the ruffle with a large basting stitch. 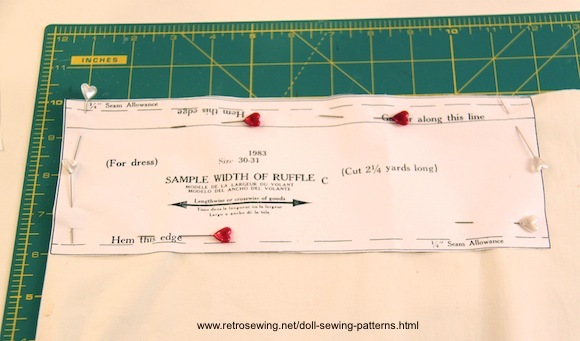 Gather the ruffle by carefully pulling the basting stitch from each end. When making the basting stitch leave lots of threat at each end for pulling and gathering. 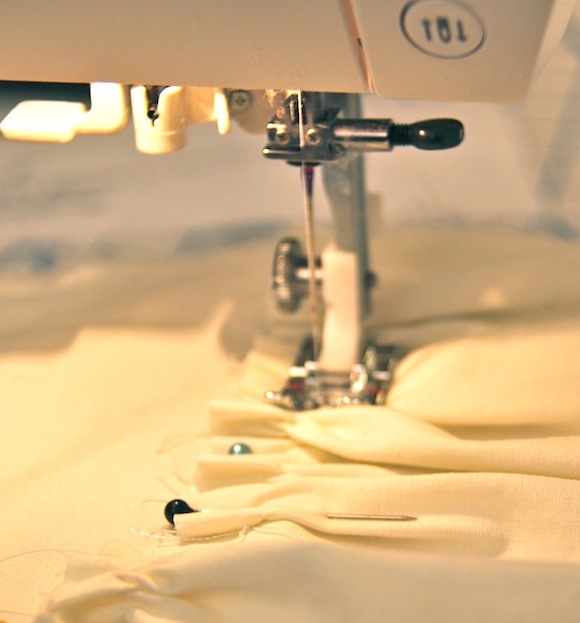 Sew the basting stitch in place with a regular stitch, as pictured above. Add the ruffle to the line on the dress. Should look like this. 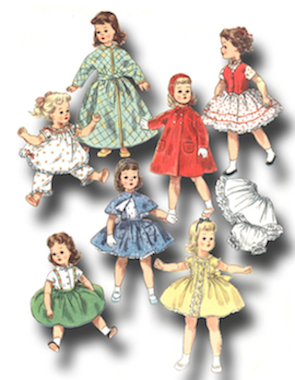 These 1950s vintage doll sewing patterns have many options and can be used for much more than a retro style. These are life-size patterns for a life-size doll. 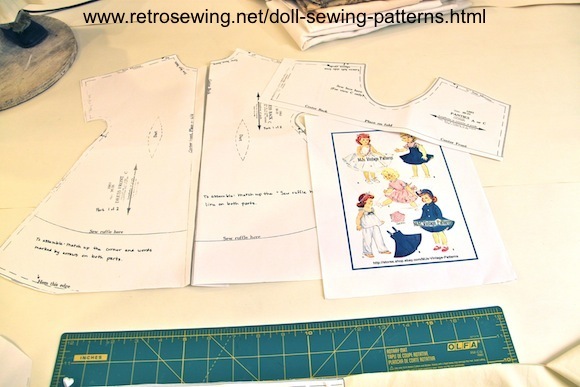 We'll be making the dress in the upper right corner for "Suzie", who is owned by my daughter. She has played with this doll since she was a kid, and still owns her now at 25 yrs old. She's 30" tall and desperately in need of a make-over. 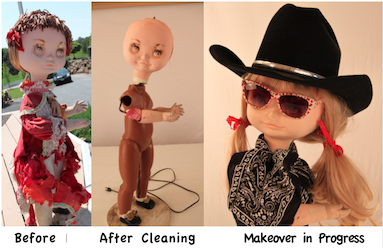 My daughter is coming for a visit this weekend, and while she's here, we'll discuss the makeover, which will include a wig, eyelashes, makeup, and new retro clothes among other things. As soon as Sue is ready for her close-up you'll see it here. Subscribe today if you'd like to be notified when this makeover video is released. Vintage 1950s Doll Pattern for 29" 30", & 31" doll. If you'd like more details on this pattern, Contact Us .